I am happy to announce the arrival of my newest pattern Sew Smalls - which are appliqued and embroidered handy items and works of art. The Basic Components Kit has the most crucial pieces needed to complete this pattern. Please enjoy and thank you so much for visiting! I have spent a great deal of time participating in workshops, clubs, guilds and collaborative artist retreats as a student, as well as a teacher. Group settings offer the highly personal creative experience I live for. Discussions take shape organically covering struggles, breakthroughs, tips and tricks. I seek to discover and share new ways of approaching even the most mundane challenges like threading needles, hiding the ends and marking fabric. One particularly ewes-ful tidbit has revealed itself as a standout student favorite over the past few years - my twist on a fairly pedestrian stitch - the buttonhole. I call my version the Ewe-niversity Buttonhole Stitch. It's the perfect stitch to neatly finish the edges of wool applique pieces as demonstrated in pictures below. 1) Bring your threaded needle up from the bottom of the fabric right next to the edge of the applique. 2) Take your needle back down next to the applique where your needle came out. Stitch in through the fabric (from underneath) and come out through the applique about ¼” from the edge. 3) Pull your thread through the applique. As you pull, a little loop is forming. Before it closes, catch your needle underneath the loop and pull closed to form one completed stitch. 4) Repeat this stitch roughly ¼” apart. 5) You can use your thumb for leverage and a gauge for distance between stitches. 6) This stitch forms a decorative finished edge, protecting the wool and holding the applique securely down. 7) To finish the stitch, put your needle down under the very first stitch and slip knot the back to give the appearance of an infinite stitch. As you can see, the Ewe-niversity Buttonhole Stitch offers a subtle, but impactful variation on an otherwise basic stitch. I hope you will use it. Don't hesitate to reach out with any questions you may have. Coming Soon: Appliqued, Embroidered and Embellished Wool Beads! Here is a sneak peek of "loose" beads as well as a sampling strung together using a wire wrapping technique. These vibrant wool balls are a product of innovative fewesion - sublime embroidery and clever embellishment applied to wool applique. These wool beads capture a multidisciplinary approach to beading and fiber arts, and demonstrate how the components of this single piece can be endlessly rearranged and incorporated into other pieces. Keep checking back as the Appliqued, Embroidered and Embellished Wool Beads Idea Guide will be out soon! More Ewes-ful Things: Cute and Coloful Pincushions! We love pincushions! And, the possibilities are endless. Cute, colorful collectible and great to give as gifts. 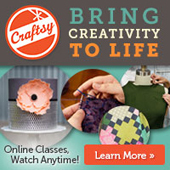 These pincushions are great for beginners and experts alike and they don't take very long to make. 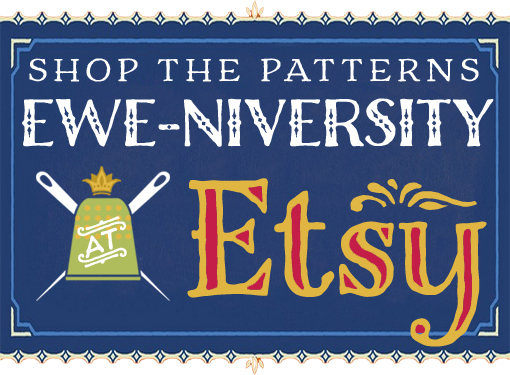 Click on the pattern image below to place your order for this Ewe-niversity pattern and idea guide. Exclusive supplies will be available soon.